Image caption US Secretary of State John Kerry (L) said the conflict in Syria needed a "political solution"
The US and UK have warned the Syrian and Russian governments that new economic sanctions could be imposed if the bombing of Aleppo continues. US Secretary of State John Kerry described the situation as "the largest of humanitarian disasters". He said that Russia needed to understand that "this war cannot end without a political solution". 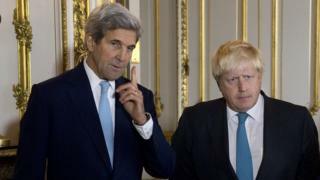 Mr Kerry is in London taking part in talks aimed at finding a peaceful solution to the Syria conflict. Speaking alongside the UK's Foreign Secretary Boris Johnson, he said that "crimes against humanity" were taking place daily in Aleppo. What is life like under siege in rebel-held Aleppo? Mr Johnson also urged Russia to "do the right thing by humanity and the people of Syria" by committing to a ceasefire. "It needs a ceasefire and it means getting back to the negotiating table in Geneva," he said. "These things will eventually come to bite the perpetrators of these crimes and they should think about it now," Mr Johnson added. He said that as part of measures designed to "keep the pressure up", additional sanctions on the Syrian regime "and their supporters" were under consideration. What if the threat of sanctions doesn't work? Little was expected from the latest talks on Syria in London, except to keep the diplomatic process going despite all the setbacks in recent weeks. The situation in Aleppo has been the main focus of international concern. Mr Johnson said it was vital to keep the pressure up on the Syrian regime and its supporters and he called on Russia and Iran to show mercy to the people trapped in Aleppo. But the means of applying pressure is limited, even as Mr Kerry reiterated that the US had not taken any options off the table. Existing sanctions on Syria's leadership have had little effect so far, and as Mr Johnson said, there's no appetite in Europe for going to war in Syria. The London talks began with discussions about Yemen and a call for a ceasefire in the two-year conflict. "This is the time to implement a ceasefire unconditionally and then move to the negotiating table," Mr Kerry said. The appeal for a ceasefire within days was joined by the UK and the UN Yemen envoy, Ould Cheikh Ahmed. The Yemen conflict, involving a Saudi-led multinational coalition backing the internationally recognised president against Houthi rebels, has seen more than 6,800 people killed, many of them civilians. On Saturday Russia and the US were joined at peace talks in Lausanne, Switzerland, by countries which back opposing sides in the war. Representatives from Saudi Arabia, Iran, and Turkey were there. Iranian troops are currently supporting Syrian forces, while Saudi Arabia is arming the opposition. After five hours in Switzerland negotiations broke up with no agreement on an end to the bombing of Aleppo or on aid for Syria's besieged towns. But all the diplomats agreed to continue talking. Dabiq: Why is Syrian town so important for IS?